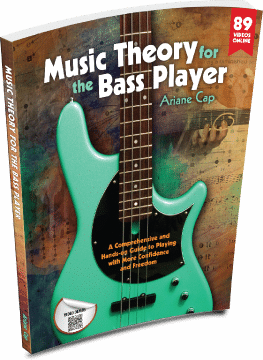 It is a pleasure to be able to give an unreservedly positive testimonial for the book and course combination Musical Theory for Bass Players by Arianna Cap. This is an excellent course. It is extremely carefully thought out and well organized and basically does exactly what it says on the tin. Over 20 lectures, each one requiring a minimum of about 100 minutes to complete, it introduces the bass player to key musical concepts in a digestible form and provides a wealth of exercises which are excellent at breaking down left and right-hand techniques and isolating and removing bad habits while promoting good ones. The author is passionate about teaching and gives frequent advise and tips on how best to learn, particularly with reference to the PORA method. The course is arranged around a variety of video demonstrations given by the author, with the student invited to play along. The tone of the course is friendly and inclusive and is pitched in such a way as to be useful to all levels of ability. My own experience of the course has been extremely positive. As a beginner to intermediate level player, I find the lessons stimulating and challenging, taking me on average about two weeks each to complete to a sufficient level of proficiency to enable progression. They are very well structured with each lesson building on the last and offering fresh challenges. The course has already enabled me to uncover various issues with my technique that I was unaware of and has provided to clear roadmap as to how to address them. In addition, my appreciation of musical theory is progressing steadily. In summary, this is an excellent, well-organized, practically useful course that is well worth its relatively modest cost.